Today’s third stage to Boulogne-sur-Mer will be undoubtedly too tough with a steep ramp in the finale, but André Greipel is determined to fight back from being edged out yesterday by Mark Cavendish. The Lotto Belisol rider was very strong in the final sprint, but Cavendish (Team Sky) came off his wheel and able to get past him just before the line. The German took a stage last year in what was his first Tour, and is determined to at least equal that, if not exceed it. He has been very strong thus season and has notched up fourteen wins; in contrast, Cavendish had eight prior to yesterday. However when it came to them going side by side, shoulder to shoulder, the Manxman had the edge. "I am extremely disappointed. The team delivered me perfectly. Cavendish was so strong, so my congratulations to him. Too bad that we had to do all the work. I can only keep trying,” he said, noting that there was a headwind and a slight rise towards the line. The next chance for the duo to go head to head is likely to come tomorrow on the 214.5 kilometre stage to Rouen. Before then, they are likely to take a back seat as more explosive riders such as Peter Sagan (Liquigas-Cannondale), Philippe Gilbert (BMC Racing Team) and Alejandro Valverde (Movistar) fight for today’s honours. 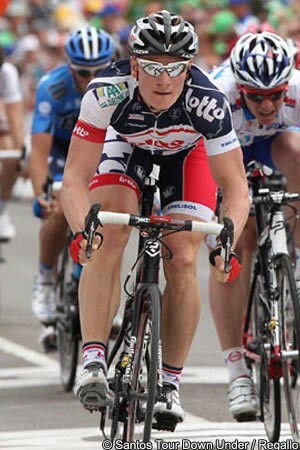 Greipel’s team will protect Jurgen Van den Broeck and Jelle Vanendert as their most suited riders to the steep finish.